Secure web-based Customer Relationship Management (CRM) software to generate more sales and provide great customer service. Customer Relationship Management (CRM) is managing the relationships you have with your customers. Businesses must have information about customers from its various channels, Information right from order initiation up to customer service call history. ANGLER Connect is a secure web-based, effective Customer Relationship Management tool allows you to utilize the modern technology to collect, collate and process this essential information. It allows you to provide better, efficient, personalized, high-quality service to your customers. 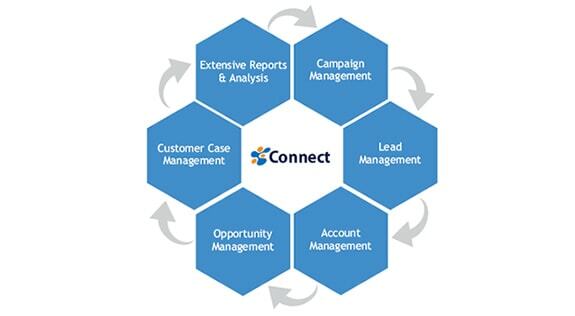 ANGLER Connect creates the customer intelligence necessary to develop customer relationships. This feature rich tool utilizes the modern technology to collect and process information right from order initiation to customer service call history. The three functional areas in this package include Marketing Automation, Sales Force Automation, and Customer Service & Support. It is an ease to use end to end solution for automating the sales process of your organization. With Connect generate quality leads; develop stronger, lasting relationships that will benefit both you and your customer.